with the base before use. The handset provided with your telephone is automatically registered as Handset 1.
or 4). You can register a maximum of four handsets. NOTE: A maximum of two handsets at a time can be used on a call. Copyright © 2005 Advanced American Telephones. All Rights Reserved. licensed to Advanced American Telephones. Press to scroll up while in menus. Press to scroll down while in menus. Press to make or answer a call. During a call, press to hang up. menu, or exit the menu display. to clear the Caller ID log (see page 26). from a string (see page 12). Press to activate handset speakerphone. 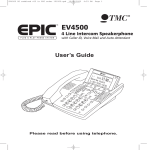 Press to initiate an intercom conversation or transfer a call (see pages 16-17). Press to make handset(s) beep (see page 13). Press to adjust message playback volume. so its battery can charge. Press to play or stop playing messages. ANSWER ON/OFF..Press to turn answering system on or off. delete all old messages when set is idle. TIME/SET................Press to review or set the answering system clock. MENU......................Press to review or change answering system options. CHANGE ................Press to change a menu option. (you may need combined service). not connect when you press PHONE. PHONE to answer the call. ID or Call Waiting services. reception, move closer to the base. microwave ovens. Avoid excessive heat, cold, dust or moisture. NOTE: Use only the power cord supplied with this product. If you need a replacement, call 1-800-222-3111. Be sure to use an electrical outlet not controlled by a wall switch. hours depending on environmental conditions, standby time is approximately four days. routers, television sets or microwave ovens. Avoid excessive heat, cold, dust or moisture. firmly so base is held securely on outlet mounting pegs. Install belt clip as shown below if desired. headset (purchased separately). For best results use an AT&T 2.5 mm headset. SPEAKER, then dial a number. Press OFF to hang up. press SPEAKER to toggle between hands-free speakerphone and normal handset use. Press OFF to hang up. recently called number (up to 32 digits). be silenced for all calls and paging (see page 18). you use the handset, speakerphone or headset. time to switch back and forth between calls. While a call is in progress, a person at one other handset can press PHONE or SPEAKER to join the call. Only two handsets can be connected to an outside call. The next phone call will ring normally. to answering systems or long-distance services. After you hang up or press FLASH, the phone automatically returns to dial pulse (rotary) service. feature to have conversations between the handsets. • Press OFF or INTERCOM at the handset. • Place the handset in the charger or base. directory or call log. Pressing INTERCOM while on an outside call will initiate Call Transfer (see page 17). incoming call will continue to ring. external call from one handset to another handset. press PHONE, SPEAKER or any dial pad keys. additional 30 seconds, the external call will end automatically. customize how the telephone works. a > symbol. Press SELECT to select the highlighted item. to the previous menu, or exit the menu display. select the one you prefer. (0), that handset is silenced for all calls and paging. The next call will ring normally. then press SELECT to save your preference. • Press SELECT again to remove the displayed message, or press OFF to exit. to send the message which turns the display message back on. only if you do not have touch-tone dialing service. press SELECT to save your preference. find and dial numbers quickly (see page 22). procedure will time out and you will have to begin again. number until you delete an existing one. Press MENU, then press SELECT to choose DIRECTORY. the telephone number when prompted. then ^V to find the number, then press SELECT. • Press DELETE to erase numbers if you make a mistake. • Press and hold PAUSE to enter a 3-second dialing pause. change it later, see page 23. Press DIR to display the first listing in the directory. at any time to exit the directory. SELECT again to choose REVIEW. entries one by one. Entries will be displayed alphabetically by the first letter in the name. to find Kevin, or three times to find Linda. SPEAKER) to dial the displayed number. deleted, an entry cannot be recovered. store in the directory, then press SELECT. be displayed after the first ring. name and number into your directory. make room for new incoming call information. the screen, it will not be saved in the call log. areas offering Caller ID service, and if both telephone companies use compatible equipment. Names of callers will be displayed only if this information is provided by your local telephone company. the list as shown at left. may not be required for local calls, or without a "1"
change how it is dialed. then press PHONE (or SPEAKER) to place the call. • Press DELETE to delete this entry from the call log. leave all call log entries intact. • Press SELECT to copy this entry into your directory. prompted to enter them (see page 21). remain available for replay until you delete them. to delete all old messages (see page 32). menu options (see page 31). menu option (see page 31). announces the day and time the message was received. until the system announces the correct day, then press TIME/SET. press TIME/SET to move to the next setting. You can press TIME/SET at any time to hear the current day and time without changing it. until the system announces the correct hour, then press TIME/SET. increments of 10 (the year can be set from 2000 to 2039). the minutes in increments of ten. provided by your local telephone company (see page 7). until the system announces the correct year, then press TIME/SET. when calls are answered by the answering system. record messages, the phone answers calls with “Hello. Press MENU until you hear "Change announcement." three seconds long will not be recorded. during playback to delete your announcement. modify other features (see page 31). a recording of your own voice. standard announcement asking them to leave a message. feature you want to modify. is heard (see list at right). move to next menu option. Press REC/MEMO to record you outgoing announcement (see page 29). access from another phone (see page 35). seconds when you have new messages. but cannot leave messages (see page 30). on or off (does not affect handset). announces the number of messages, then begins playback. recording time left, you will hear time remaining. • Press VOLUME button to adjust speaker volume. • Press REPEAT to repeat message currently playing. • Press DELETE to delete message being played back. • Press PLAY/STOP to stop playback. in your household use the answering system. long will not be recorded. Press PLAY/STOP to stop recording. page 32 for other options). explanations of other displays in this counter. currently playing (flashes if you have new messages). Current volume level while adjusting. or announcement up to 90 seconds (page 29). Memo recording exceeded 99 seconds. new messages can be received. Clock needs to be set (see page 28). Announce only mode is on (see page 30). System is being programmed or initialized. system setting is turned on or off. unless you have changed it). code is 19 by default; see page 31 to change it. Press to hear all messages. Press to hear new messages. Press to stop any operation (stop playback, stop recording). hear playback of new announcement. Press 8, wait for beep, then begin speaking. Press 5 to stop recording. Press # 9 to review remote access code. the call will end automatically. Press to hear list of features & commands. Press to turn off answering system. If off, system will answer after 10 rings. New calls (press CID to review call log). Out of range during off-hook. Confirmation tone Programming command completed successfully. On when speakerphone is in use. The handset is in use. The handset is on hook. You are accessing an empty directory or call log. You are saving to a full directory. The call is on mute. The handset speakerphone is in use. There is a call coming in. NEW VOICE MAIL There are new voice mail messages. There are new calls in the CID log. BASE IS PAGING The base is paging handset(s). An extension phone is in use. There is no telephone line connected. already stored in the directory. placed in the base unit or charger. the base unit or charger. handset must be registered with the base before use. The handset provided with your E5640 is automatically registered as Handset 1. (Handset 2, Handset 3, or Handset 4). You can register a maximum of 4 handsets. register one additional handset, which will be assigned number 4.
cannot register any additional handsets to the E5644B. NOTE: You can replace E5644B handsets (see page 40). Enter base ID, then press SELECT. located on the bottom of the base unit. • Your handset will display “ENTER BASE ID”. of the base unit (E5640 or E5643B). • Press SELECT to accept the code and complete registration. register a maximum of four handsets per base unit. handsets (4) or wish to change the assigned handset number of your registered handsets, you must first de-register the handsets, then re-register all handsets. • Unplug the power supply from the base unit. • Remove all handsets from the charge cradles and base. indicators are lit (this could take up to 10 seconds). • Release the HANDSET LOCATOR button. de-registered from the base, and can now be re-registered (see page 41). handsets to a new base unit, if you have replaced your base unit for any reason. • Make sure your handset batteries are properly installed and charged. • Enter the 15-digit Base ID number from the bottom of the base unit. • Press SELECT to accept the new code and complete re-registration. • Unplug the old base unit. Your handset will display "SEARCHING...". • Install the new base unit by plugging it into an electrical outlet and phone jack. • Press and hold the SELECT key until the handset displays “ENTER BASE ID”. • Enter the new15-digit Base ID number from the bottom of the new base unit. now registered to the new base. “ENTER BASE ID”. To make corrections while entering the code, you can erase digits by pressing the DELETE key. four handsets per base unit. Service, visit our web site at www.telephones.att.com, or call 1-800-222-3111. Make sure battery is installed and charged correctly (see page 9). set to pulse (see page 19). Make sure all extension phones are hung up. your wiring or local service. Call your local telephone service company. If these suggestions do not work, unplug the base, remove and reinsert the battery, then place the handset in the base to re-initialize. Make sure the ringer is on (see page 18). allow all of them to ring. Try unplugging some of them. You may be out of range. Move closer to the base. interference. Try moving the appliance or base to another outlet. wiring or local service. Call your local telephone service company. installed at every phone jack that has a phone connected to it. Contact your DSL service provider for filter information. Other nearby cordless telephones can cause interference. Try moving one of the cordless telephone bases. system disconnects the call after 4 minutes. recording and disconnects the call. stops recording and disconnects the call. Make sure that the answering system is on (see page 27). have new messages waiting (see page 31). used by the local telephone company. You need to reset the answering system clock (see page 28). Make sure to enter your remote access code correctly (see page 35). touch-tone telephone and cannot activate the answering system. over before entering the code. There may be noise or interference on the phone line you are using. Make sure answering system in on (see page 27). Make sure Announce Only is off. normal tone of voice, about nine inches from the base. ^ on the base to increase speaker volume. answering system from any touch tone telephone. your 2-digit access code (preset to 19). Review remote access code ..
licensed to Advanced American Telephones. Printed in China. licensed to Advanced American Telephones. Printed in China. Issue 3 AT&T 10/05.